• Lie catching is a fun and powerful tool for mastering deception theory and micro expressions! • #1 Theory and training tool! • Short, simple and catchy explanations of complex subjects! Deception specialists, psychologists and special forces professionals can spot a lie on the fly, and now so can you! Without the expensive training tools and complicated theory books, Lie catching gives you the ability to get a grasp on this fascinating area of people relationships, understand basic concepts and even train yourself in a variaty of training tools and simulators, from the convenience of your iPhone. If you want to spot a lie you need to be familiar with main focus points, signs and signals in liar's behavior. In this application we divided these tells into main groups so you can master this complex but otherwise breathtaking sphere of human life. We focus on both basic and mixed emotions, their characteristics and ways to spot them on your conversational partner's face. Training section will provide you with an actual experience in recognizing various emotons. 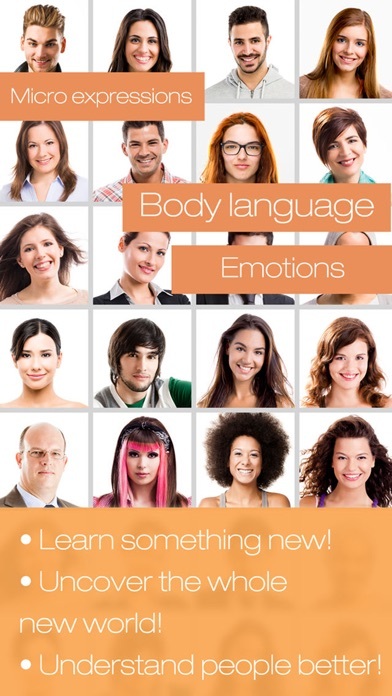 You can start with basic emotions training, proceed to spotting micro-expressions and finally expand your knowledge with the mixed expressions simulator. What Lie catching offers to you?